Today, I’m sitting by myself writing in an open-window cafe in a quaint-turned-busy neighbourhood near the beach. It’s March Break, the weather is unseasonably pleasant by Toronto standards, and the playground across the street is bursting at the seams with children playing. I first started coming to this cafe 4 years ago after leaving my 9-5 to work on my solo projects. I actually haven’t been back here since then. The coffee shop has been replaced or transformed into a mid-scale tea shop, but not much else has changed. For myself, however, much has developed since then. From those humble beginnings at this shop, I’ve found myself sitting with my laptop busy working in countless different locations: Coffee shops all over North America. A street canteen in Cambodia. In my car tapping the free wi-fi outside a McDonald’s somewhere in South Dakota. A maid cafe in Osaka. A laundromat in Alberta. On a beach in Thailand. Most of the time, I’m not so mobile, so I’m usually getting things done in Toronto or Vancouver. Over the years, I’ve learned quite a bit about productivity, and today I’d like to share my personal tips if you plan on working on a self-fulfilling project or muse. 1. Don’t work at home. Even when it’s a wintry -10 degrees Celsius outside, I will cycle 3 kilometres to a location outside my home to work. If it’s colder, snowing, or raining heavily, I’ll take public transportation. I don’t have to make the journey through inclement weather, but I do for a reason. Working from home sounds great from a 9-5 office perspective, but when you work for yourself, the value of your time emerges like a divine revelation, and you realize it’s terribly unproductive when surrounded by your creature comforts. There are just too many distractions at home. I don’t have a television, but I still have my kitchen. At home, I’m lured to take frequent, unnecessary breaks to prepare food, cook something, or even work on a dance move. Yes, dancing is an important part of my work, but it’s better done at a scheduled time, rather than breaking concentration or rhythm from another task. At a coffee shop, I’m usually more composed, and won’t break out into song and dance (as often!). If you do have to work at home, then try your best to find a separate space or room to work in. 2. No Internet. The Internet is even more of a time waster than television. From a productivity perspective, it’s like television on steroids and crack. You can watch a limitless amount of videos on Youtube, check your friend’s ongoings on Facebook, read the news, or even deceive yourself into self-education by endlessly hopping through irrelevant Wikipedia articles. I’m writing this post just typing into a text file offline. The Internet is available here, but I’ve purposely disconnected my laptop. Later, I’ll upload the contents of this file to my website. The beauty of working offline is that you’re not confined to coffee shops. You can work on a picnic table, under a tree, etc. Just make sure your environment isn’t too distracting. Of course, there are times when you do need the Internet, and that’s when you connect. The willpower to disconnect is another story. How do you get this magical willpower? Try one busy day working without the Internet. Make sure you have a list of attainable tasks on hand. At the end of the day, compare your productivity to another day. Satisfying? Now, remember that gratifying feeling and conduct it towards the next day you want to be uber-productive. Similarly, rarely do you need a fast Internet connection. Fast Internet connections are great for time wasters – mostly, streaming videos and surfing media-heavy sites. I’ve found that for most tasks, I don’t need a fast Internet connection. 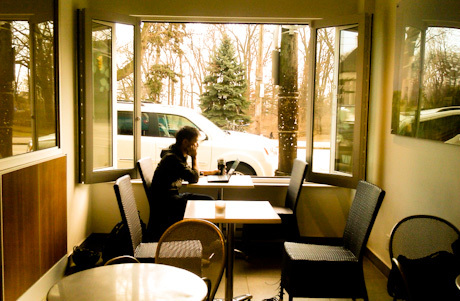 Sometimes, I stick to a cafe with slow Internet connections or tether my phone (CAUTION: this can be costly!) to complete a few Internet-required tasks. As a final tip, I also recommend bundling all your Internet-related tasks and do them all together. When I re-discovered the library, I fell in productivity love. After unjustly condemning the library post-academically as either a listless institution or a child’s playground, I first wandered into one after jettisoning myself out of an overcrowded Starbucks. It was a godsend. The library is quiet, has ample table space, and the presence and studious energy of other busy-bodies keeps you focused. Need coffee while you work? Most of them allow you to have a cup on-hand. And the books. Wow. There’s a lot. Not just trashy old ones, but good ones for all types of readers. Feel free to borrow some, but make sure you save the leisure reading as a pre-sleep, relaxation ritual. The quietness is great, but if you find the library too quiet, I recommend listening to some high-energy electronic music on some headphones. Oddly enough, you can find some great album on-hand in the library. In my opinion, the library, not the coffee shop, is the perfect place to work. 4. Acclimatize to the coffee shop high. This is the main reason I haven’t come back to the coffee shop I’m sitting in right now. I was too enamoured with the idea of working out of a kitschy cafe (i.e. I’m not in an office! ), and was constantly distracted by the novel and seemingly pleasant environment. Of course, I’m accustomed to the coffee shop lifestyle now, so it’s no longer a problem. To be frank, my favorite “coffee shop” for the longest time was a McDonald’s in downtown Toronto. I know, I know – I sold out 🙂 I could’t eat anything there since I’m a vegetarian, but the Internet was there when I needed it, the coffee is decent, refills are free, and the table space is big – I find it difficult to work on those tiny tables in some coffee shops. To top it off, the somewhat uncomfortable bench stools have the adverse effect of putting me in a focused sitting position. Admittedly, that McDonald’s location does sport an abnormal proporation of colorful but mentally unstable and drunk patrons, but I don’t really mind their antics so long as I’m in a productive mode. 5. Stick to one place. As wondrous as it sounds to sit with a laptop in paradise, the reality is that when I’m mobile, I’m just in maintenance mode. To actually move foward on great projects, there is a pre-requisite to be in a stable environment. Find one or two places that you find yourself productive working in, develop a routine, and stick to them. Socialize/move around on your breaks. This one’s not as important as the rest if you’re not always on your own. I have a friend who was doing quite well with his own business, but decided to return to the office due to isolation creep. Believe it or not, many people like office work due to the daily people interaction, and I can fully understand. If I feel I’ve been isolating myself in my work too long, I’ll chat with strangers on my breaks. It’s more of a long term cabin-fever prevention tactic than anything else. Too much isolation can be harmful. I have improved my work-at-home routine. It includes getting dressed and mentally “going to work” but it is stil challenging. I also had a chuckle about libraries having ample space; our local library is often very busy as we are near a university and it can be hard to get a corral or table. Always interesting to see what others are working on or studying. Thanks so much for your support! It’s really important that I communicate authenticity to my students, that my work comes from real experiences, and I’m not just a pickup artist trying to make a buck. Just sending a note, I check on your blog now and then and I also like traveling and working in remote places but seem a little more disciplined when it comes to work. To some degree I do enjoy working alone in my home office, no sound, just me and a keyboard but I get out two times a day and run my errands so I have interaction. Thanks for your blog, I do get an insight on how others operate. Best wishes. Yes, everyone works differently. One of my mentors has no choice but to work in a home office since he’s a music producer and has tons of equipment, though he’s optimized his office for maximum productivity. One of the tips he gave me was to use a large whiteboard calendar (and not Google calendar), and put down all the goals he needed to accomplish on each day. Ah, this has been useful. The socialization “Hi, I’m on a break and you look interesting. I’m Eddy.” seems like a great 10 minute break between tasks. I don’t know how you could stand McD though. I’ve been spending the majority of my time working in one for the last few weeks (closest to home). The atmosphere is just so unaspiring that I find it near impossible to get myself inspired (even with the great interior design and productively uncomfortable seats). How did you not let the atmosphere brought in by the patrons get in the way of your inspiration Ki,une? Haha so true! I even spend almost 20 hours per day to sit and use internet and in this era, internet is a primary needs. That is why cozy place, comfortable chair, and internet is a must for a cafe to invite customers. But it also can be a harmful way for the revenue of the cafe. It needs a tool to manage it.